MEMORANDA ON THE CIVIL WAR. The assertion of a fact, even if it be an assertion involving a question of character, made by one of world-wide reputation, is generally accepted as true. A few interested in the individual who may be the subject of attack will hear his defense, if he make any ; and perhaps a larger few whose sense of justice impels them to hear both sides, will listen before pronouncing sentence. To these two classes I address a few words. General Grant makes this general charge without assigning a reason for it or attempting to justify it by citing any instance in which I had failed in any duty I had been called upon to perform. This gives me the right to call General Grant himself as a witness in my own behalf, and to assert that the reasons which moved him to say that “the objections to my confirmation were well founded” were of a personal, and not of a public nature. The battle of Chattanooga ended on the 25th of November, 1863 – my name was not sent to the Senate till the 15th of March, 1864. On the 18th it was returned to the President, with the request that the date of rank should conform to the date of nomination. On the 23d of the same month it was again sent to the Senate, and my nomination was confirmed on the same day. 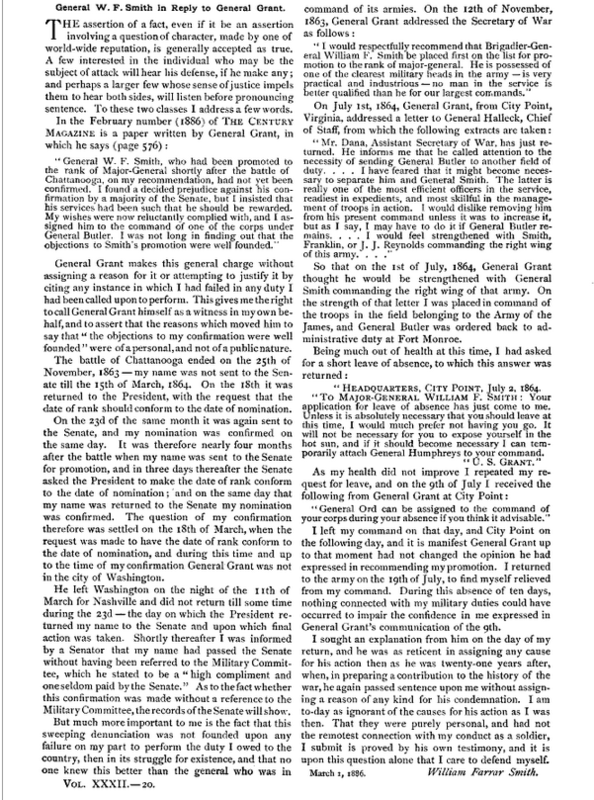 It was therefore nearly four months after the battle when my name was sent to the Senate for promotion, and in three days thereafter the Senate asked the President to make the date of rank conform to the date of nomination ; and on the same day that my name was returned to the Senate my nomination was confirmed. The question of my confirmation therefore was settled on the 18th of March, when the request was made to have the date of rank conform to the date of nomination, and during this time and up to the time of my confirmation General Grant was not in the city of Washington. He left Washington on the night of the 11th of March for Nashville and did not return till some time during the 23d the day on which the President returned my name to the Senate and upon which final action was taken. Shortly thereafter I was informed by a Senator that my name had passed the Senate without having been referred to the Military Committee, which he stated to be a “high compliment and one seldom paid by the Senate.” As to the fact whether this confirmation was made without a reference to the Military Committee, the records of the Senate will show. So that on the 1st of July, 1864, General Grant thought he would be strengthened with General Smith commanding the right wing of that army. On the strength of that letter I was placed in command of the troops in the field belonging to the Army of the James, and General Butler was ordered back to administrative duty at Fort Monroe. “HEADQUARTERS, CITY POINT, July 2, 1864. “To MAJOR-GENERAL WILLIAM F. SMITH: Your application for leave of absence has just come to me. Unless it is absolutely necessary that you should leave at this time, I would much prefer not having you go. It will not be necessary for you to expose yourself in the hot sun, and if it should become necessary I can temporarily attach General Humphreys to your command. I left my command on that day, and City Point on the following day, and it is manifest General Grant up to that moment had not changed the opinion he had expressed in recommending my promotion. I returned to the army on the 19th of July, to find myself relieved from my command. During this absence of ten days, nothing connected with my military duties could have occurred to impair the confidence in me expressed in General Grant’s communication of the 9th. I sought an explanation from him on the day of my return, and he was as reticent in assigning any cause for his action then as he was twenty-one years after, when, in preparing a contribution to the history of the war, he again passed sentence upon me without assigning a reason of any kind for his condemnation. I am to-day as ignorant of the causes for his action as I was then. That they were purely personal, and had not the remotest connection with my conduct as a soldier, I submit is proved by his own testimony, and it is upon this question alone that I care to defend myself. March 1, 1886. William Farrar Smith.